I heard about Feline Instincts through your book ‘My Natural Cats’ which I came across on-line. 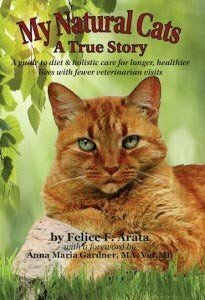 After my 16.5-year-old male kitty developed IBD, was misdiagnosed for the first four months of diarrhea, three vets later and all conventional medicine/treatment making the diarrhea and his overall general condition worse I started to research a natural approach for healing feline IBD. Both my cats had urinary obstructions before I adopted them as well and so my research included learning more about that issue also as food is the major contributor to both these conditions. Both boys had been kept strictly on Royal Canine Urinary SO because of their obstructions at the recommendation of the vet from whom I had adopted them. She is a very good vet and has a heart of gold but has only had traditional veterinary schooling, and I, out of fear of them re-obstructing, listened to what I thought was the best advice. Thankfully, through your book I was also happy to meet Dr. Anna Gardner via a phone consultation and now feel confident that I have the proper guidance to keep moving forward with the natural healing approach! Thank you for your wonderful effort you are now sharing with all feline and canine families worldwide who have the good fortune of coming across and reading your book!